Make a dazzling statement with the Sumner twenty-light pendant chandelier featuring clear crystal teardrops and a rich antique brass finish. Illuminate your home with this stunning twenty-light pendant chandelier. This gorgeous pendant features a warm, antique brass finish with faceted clear crystal teardrops in each of its diamond openings. From Vienna Full Spectrum, this radiant chandelier is sure to be the centerpiece of your dining room or living area. 37" high x 16 1/2" wide. Canopy is 5" wide x 1 1/2" high. Weighs 29 lbs. Includes 6-feet of chain, 12 1/4-feet of wire. Twenty maximum 40 watt or equivalent type B bulbs (not included). 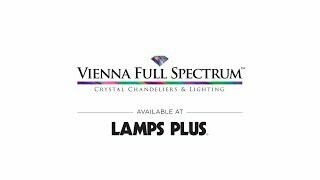 Sumner twenty-light crystal pendant by Vienna Full Spectrum. Antique brass finish; faceted clear crystal teardrops.